In 1970, the Cenotaph for Korean Atomic Bomb Victims was erected in Hiroshima by local Koreans, most of whom were associated with South Korea. In the 1980s, this cenotaph gradually came to be seen as discriminatory against Koreans due to its location outside the Peace Memorial Park. In the 1990s, Hiroshima City and the two major organizations of Japanese-resident Koreans (zainichi Koreans), pro-South Korean Mindan and pro-North Korean Sōren, began negotiations to create a “unified” cenotaph that would be moved inside the Park. However, discussions reached a deadlock due to the rivalry between Mindan and Sōren, and also an internal split that occurred within Mindan. This paper will examine why the debate on the relocation of the cenotaph reached a deadlock in the 1990s, with a focus on the identity of zainichi Koreans. While Mindan and Sōren have their own collective identities, each individual zainichi Korean may identify oneself on various levels, from social to personal. An individual’s social identity develops through belonging to and participating in activities of social organizations. Given the rivalry between Mindan and Sōren, one’s social identity will be influenced by whether one is involved with Mindan or Sōren. In contrast, his/her personal identity may develop through more personal experiences and generally transcends the simple Mindan-Sōren division. The analysis will show that the relocation debate was caused by these various identities, which manifested and became dominant depending on context, leading to consonance or dissonance both between and within organizations. University of Hawai’i Press and Korean Studies present the following early release articles through a partnership with Project MUSE. 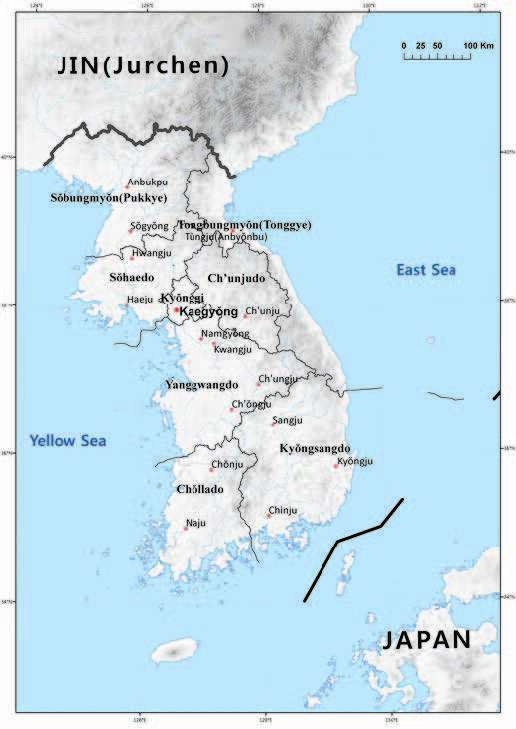 All Korean Studies early release articles may be viewed online here. Please note: Early release manuscripts have been through our rigorous peer-review process, accepted for publication, and copyedited. These articles will be published in a forthcoming issue of the journal. These articles have not yet been through the full production process and therefore may contain errors. These articles will be removed from the early release page once they are published as part of an issue. The next complete volume of Korean Studies will appear in 2018. Sign up for new issue email alerts from Project MUSE here. University of Hawai’i Press is proud to present the early release of the following article from Korean Studies through a partnership with Project MUSE. Abstract: Two types of implicit liberty were the foremost features of the philosophy produced by Tasan Chŏng Yagyong (1762–1836), a Confucian scholar of the Chosŏn dynasty in Korea. The first was political liberty, which enabled people to select and dismiss their ruler. Tasan’s notion of political liberty included a stern admonition to rulers and local officials, stipulating that if they collected unfair taxes from the people, the people had the right to take necessary actions to survive. The second was economic liberty, which enabled people to relocate to another village for financial reasons in the hamlet- field system. Under the well-field system, rulers distributed their farmland among the people equally for their personal use, and therefore they were not tenant farmers. Economic liberty was implicit and advocated that the people lead lives that were consistent with Confucian moral principles. Browse all Korean Studies early release articles online here. Stay tuned for more early release articles from UH Press journals. Context: The effects of militarization and colonialism in Hawai’i are brought into focus with a historical analysis of how the U.S. government took ownership of and dispersal of supplies after World War II. The market produced by these historic events continues to affect the current Hawai’i-U.S. mainland political climate, and are exasperated by comments from the 45th president about “boycotting” Hawai’i. Context: What does reconstruction look like in a nation that lost a war and suffered two nuclear attacks? The Review of Japanese Culture and Society compiled a section of articles from Japanese photographers, architects, advertisers, and designers to share perspectives on the past and present postwar landscape. Context: In a search for validity, scholar Victor D. Cha unpacks a rare archival account of the 1953 mutual defense treaty negotiations that led to the creation of the U.S.-Republic of Korea (ROK) alliance. University of Hawai’i Press is proud to present the early release of the following book reviews from Korean Studies through a partnership with Project MUSE. Map of Koryŏ dynasty, from Koryŏ: An Introduction in this issue. This year’s issue of Korean Studies includes a special section focusing on the middle kingdom Koryŏ. Koryŏ, Korea’s middle kingdom in that it is lodged between Silla and Chosŏn, is the least studied era of Korea’s history. And yet it offers intriguing insights into Korea’s long tradition as the Koryŏ state participated actively in international events while at the same time building internal institutions in response to its own unique experiences. The collection of papers that follows introduces both these international and domestic themes, providing a nuanced understanding of both Koryŏ and Korea. 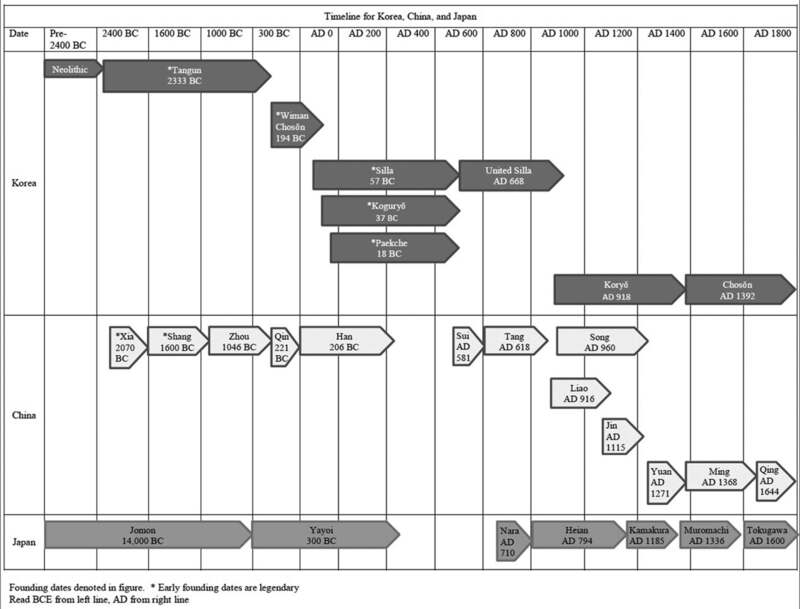 Timeline of Koryŏ dynasty in its chronological context from Koryŏ: An Introduction in this issue.